It’s been a while since I’ve done a concert review, so here is a fresh one. Last night I saw A Perfect Circle at The Honda Center in Anaheim, CA. Overall, it was a great show with a good mix of material from the new and previous albums. I was not expecting an opening act, but they had two openers, Night Club and Tricky. The show was visually stunning, with lots of colored lights and a cool rear projected video to go along with the music. The players are all pretty much silhouettes throughout the show, so that’s the downside if you like to see the band members clearly. The venue isn’t known to have very good sound quality, so some of the louder songs didn’t sound great but the rest of the songs were decent. My favorite section of the set was Peace, Love and Understanding – Vanishing – The Noose. On Thursday I went to see Pearl Jam at the Viejas Arena in San Diego. I went in with what I was sure were unreasonably high expectations, but I was not disappointed. What I got was the best live performance I’ve seen, removing any doubts that Pearl Jam is the epitome of rock bands. The show lasted about three hours and had a good mix of new songs, old songs, and a few covers, and they seemed to save the best for last. The sound quality was excellent, especially for an indoor arena. Pearl Jam’s sound people seem to know what they are doing, instead of just turning everything to 11. Eddie did a lot of talking and drank from a bottle of wine between songs (he seemed a bit drunk near the end), even passing a bottle to his mom via audience. They ended the show with The Who’s Baba O’Riley, Yellow Ledbetter with The Star Spangled Banner guitar outro, and then a great cover of Rockin’ in the Free World. Overall, it was a great set. The only thing missing that I would have liked to see was Jeremy, Daughter, and/or Corduroy. If you like rock music, Pear Jam is a must! I saw Soundgarden perform at The Wiltern on the 16th. The performance was excellent, the mixing could have been better (the bass drowned out the leads), and the crowd was mature (someone even brought a young child). Overall it was a great experience. I never thought this would happen. The Wiltern, named after its position on the corner of Wilshire and Western, was a very nice setting. Entering the lobby was like entering a movie theater in the 50’s. The walls and ceiling had lots of fancy carving and molding to admire while waiting for the show. Here is the set list. It was a good mix of songs spanning their entire career. Matt Cameron’s son played guitar on Eyelid’s Mouth. Here is a video I found from that night. I was right behind the person recording the video, so this was pretty much my view. I read a book called Why We Believe in God(s): A Concise Guide to the Science of Faith by J. Anderson Thomson Jr. MD and Clare Aukofer (I believe it was Penn Jillette who recommended it). It attempts to explain why humans have a natural susceptibility to believe in the supernatural by describing various behavioral adaptations in our species. It even goes into some of the physiology and brain chemistry involved. Some of parts I found most interesting were about the evolution of our species and reasons some of the social adaptations were successful. It also includes an explanation for our natural cravings for food high in sugar and fat, which I found interesting. The overly positive reactions in our brain to sugar and fat are leftover adaptations from when these were very difficult to obtain (there were no grocery stores for cavemen apparently). It also had interesting insights into psychology and several studies of the brain and behavior of young children. There were many less obvious things that were revealed which really got me thinking. Thomson, J. Anderson; Aukofer, Clare; Richard Dawkins (2011-06-01). 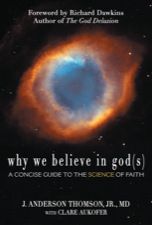 Why We Believe in God(s): A Concise Guide to the Science of Faith (Kindle Locations 766-769). Pitchstone Publishing. Kindle Edition. Pandora Radio is a free internet streaming radio service that allows you to create personalized stations. The stations select music based on similarity using data from The Music Genome Project. You tell it something you like and it will find other songs you probably like. As you listen, you can tell it what you like and dislike so it gets a better idea of your preferences. I’ve been using Pandora on and off for a few years and it works pretty well. I’ve discovered some great bands I never knew I liked or even heard of. It’s a great way to discover new music. Of course it also plays a lot of your favorites, too. You can even further customize your stations by mixing them together or manually adding bands for more variety. The free version has some short ads and a few limits on usage, but it isn’t too bad. I’m actually thinking of getting the paid version that removes the ads and limits, as well as gives higher quality and a desktop application. Right now it’s only $36/year. So what can you expect from three blue men on a stage? The most accurate answer to that would be to expect the unexpected. The show includes sounds, lights, comedy, and just plain weirdness. There’s even some educational parts if you can believe that. They don’t talk, but they still manage to communicate and have a great personality simply through body language. They act almost like aliens exploring their environment and they seem very intrigued by the audience and human culture. They do some pretty cool stuff with improvised instruments made mostly from plumbing. Just when you are thinking “that’s pretty neat,” something else happens that makes you think “huh?” (not huh as in “that was stupid”, but huh as in “haha, that’s crazy” IYKWIM). They also have a talented backing band with several drum kits, guitar, bass and Chapman stick. I would definitely recommend seeing this show, especially if you want to see something totally unique. There’s something to enjoy for people of all ages. Not only is it visually entertaining for younger audiences, it also has some deeper meaning for older audiences to appreciate. Even the signs telling you to turn off phones are funny. Also as an added bonus, you can meet the blue men after the show if you want. Notes: There are strobe lights used in parts of the show, so you should be careful if you have epilepsy or other problems like that. There’s nothing inappropriate to worry about, so feel free to bring kids or family along. Individual shows may vary.